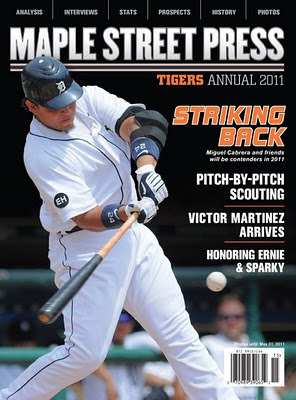 As I mentioned previously, the 2011 Maple Street Press Tigers Annual will be on sale at Michigan newstands on March 1. Kurt Mensching of Bless You Boys is the editor and head writer of the book and and he recently revealed the table of contents. The book can be pre-ordered now at Maple Street Press. I wrote articles on Austin Jackson and 1930s and 40s slugger Rudy York, but that's only a small part of the book. Other authors include John Parent and Matt Snyder of Motor City Bengals, Detroit News writer Tom Gage, Ian Casselberry of Big League Stew, Michael McClary of Daily Fungo, and Bill Ferris of TigsTown among others. Even Tigers second baseman Will Rhymes contributed an article discussing what it's like to be a major league rookie. It is 128 pages about the Tigers with beautiful photography and no advertisements. It includes previews of the upcoming season, detailed prospect reports, historical pieces and much more. It should be great spring training reading, so check it out now at Maple Street Press.